After experiencing the lovely feeling of departing and arriving on time, we had a moment of trepidation when we arrived at Addis Ababa airport and our arranged pick-up wasn't there. A few very expensive international-rate phone calls later however saw us off to our guest house and soon feasting on some tibs firfir and St George beers. The spicy berbere sauce and injera was music in our mouths. Finally, local food with real flavour! The next day was spent organizing the remainder of our Ethiopian jaunt, as we had decided to take two internal flights, at the princely total of $220 for the both of us, rather than spend four days in buses in what are reputed to be some of the worst roads in Africa. We also discovered that Addis has draught beer, which we hadn't seen since South Africa, along with forty cent macchiatos. The rest of our time in Addis was spent punctuated by regular indulgences in the both of these, along with lots more injera, the slightly sour pancake that Ethiopians eat with every meal. We also ventured to our first museum for the trip, the Ethnological Museum at the Addis university, housed in Emperor Haille Sellassie's former lodgings. It provided a great briefing on Ethiopian religion, food, tribalism and way of life. It also lead to us walking 16km around the city in thongs, as we refused to pay more for a taxi than our day's total food. The experience of Addis was nearly all positive, except for Mads waking up in the middle of the night covered in little bites. Convinced they were bed bugs she slept the rest of the night on the concrete floor, covered in clothes and a mosquito net. Not fun. Tom continued sleeping in the bed. 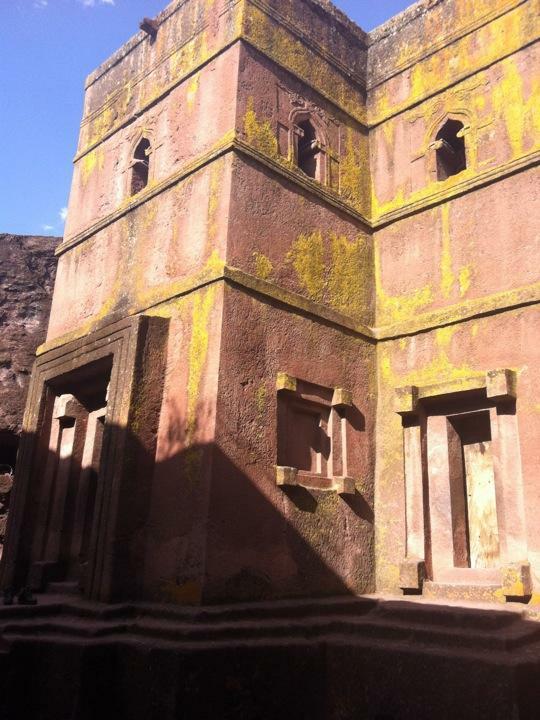 Up at 4.30 we cabbed to the airport, paid too much for coffee and muffins, and were soon in Lalibela. The views coming in to land were astounding, great rift valleys folding the landscape like a rumpled green sheet. This was only eclipsed by the scenery viewed from the minibus on the half hour drive to town, enormous plateaus lining one side of the landscape, towering hills the other. It was absolutely breath taking, so much so that Mads got a blood nose. Our full day in Lalibela we were guided about by Addis, who turned out to be $16 well spent. It is hard to describe the stone hewn churches of the area, dug using hand tools out of a single piece of rock. Many of these churches are free standing, and would be marvelous pieces of architecture if they had been constructed using separate pieces of stone. The fact that they have been carved down and are monolithic in nature blows the mind. It was an absolute highlight to see these sixteenth century creations, and anyone who has a regard for ancient architecture should place this area high on their list. Tomorrow we are off to Axum for more religious constructions, and despite the fact that neither of us are religious, these kinds of places really are quite special.